On 21st September the leftwing won during the 5th elections organised since the independence of Slovenia. The Social Democratic Party (SD) led by Borut Pahor won 30.50% of the vote (29 seats) ahead of the Democratic Party (SDS) led by outgoing Prime Minister, Janez Jansa, which won 29.32% of the vote (28 seats). These two parties are followed by Zares (Real), a party founded in March 2007 by 7 MPs former members of the Liberal Democratic Party (LDS) and led by Gregor Golobic, which won 9.40% of the vote (9 seats), the Democratic Party of Pensioners (DeSUS) led by Karl Erjavec, outgoing Defence Minister which won 7.54% of the vote (7 seats) and the National Party (SNS) led by Zmago Jelincic, 5.46% (5 seats). Two other parties will be represented in the Drzavni Zbor, the lower chamber in Parliament: the Peoples' Party-Youth Party (SLS-SMS) – 5.24% and 5 seats- and the Liberal Democratic Party (LDS) led by Katarina Kresal – 5.19% and 5 seats. Two of the 90 seats in the Drzavni Zbor are attributed to the Italian and Hungarian minorities. Turn out rose to 62.16%, slightly more than during the previous elections on 3rd October 2004 (+ 1.52 points). The constituency of Ljubljana Centre had the highest turn out (68.24%), that of Ptuj, which was also the only one to have placed the Democratic Party in the lead, was where the abstention rate was the highest (56,58%). "I am expecting the Social Democratic Party to win the best result in its history," said Borut Pahor as he went to vote in Sempeter near the Italian border. His intuition was correct since his party performed well, improving its score by 20.3 points (and 20 seats) in comparison with the election on 3rd October 2004. "We managed to achieve this thanks to a moderate policy which comprises a good perspective for the government after these elections. We shall lead the government in the interest of all the citizens," Borut Pahor said when the results were announced. The Social Democratic Party will therefore form an alliance in the next government with its 2 partners, Zares and the Liberal Democratic Party. It might also be joined by the Democratic Party of Pensioners that generally allies itself with the election winner. 46 year-old Borut Pahor is a graduate in social sciences from the University of Ljubljana. He joined the Communist Party at the end of the '80's and supported the reform wing of the party led by former President of the Republic (1990-2002) Milan Kucan. He entered Parliament in 1990 under the label Communist League-Democratic Reform Party. In 1997, Borut Pahor was elected leader of the Social Democratic Party. He chaired the National Assembly between 2000 and 2004 when he also became an MEP. Outgoing Prime Minister Janez Jansa recognised his defeat. "We wanted to win a majority in Parliament to continue the development of Slovenia but we do not have the mandate to do this. We have to admit our defeat," he declared. Although this was foreseeable given the decline of the government forces in the local elections on 22nd October and 12th November 2006 together with the defeat of Alojz Peterle in the presidential election on 21st October and 11th November 2007 (31.74% of the vote in comparison with 68.26% for Danilo Türk, who was supported by the Social Democrats), Janez Jansa had started to make a come back in the most recent polls. He also tried to stand as victim of the former Communists after having been accused, together with the Defence Minister, by journalist Magnus Berglund of the Finnish TV channel YLE, of having received bribes during the purchase of 135 armoured vehicles in 2006 by the Defence Ministry to a total of 278 million € from manufacturer Patria, a company owned by the Finnish State to a total of 73%.. In spite of his defeat the outgoing Prime Minister can be pleased that his party maintained its result in comparison with the election on 3rd October 2004 (+ 0.24 point). However the Democratic Party's allies' results were not so good. 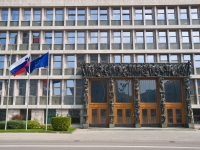 New Slovenia (NSI) led by former Prime Minister (3rd May 2000-17th November 2000) and outgoing Finance Minister, Andrej Bajuk, did not manage to achieve the 4% threshold vital to be represented in parliament. It won 3.25% of the vote and lost 9 MPs. The People's Party also suffered a loss (-2 seats). The Democratic Party of Pensioners came out better since it won three additional seats. "In spite of this political change we should not witness any major economic changes," says Janez Sustersic, professor at the University of Primorska who adds, "a leftwing government will be more open to social issues and will tend less towards a policy of increasing the competitiveness of the Slovenian economy." The two main political parties are putting forward similar programmes that focus on the continuation of privatisations and the fight against inflation. The latter rose to its highest level ever in June (7%) and is threatening the good health of the economy that has long been quoted as a model (6.1% GDP growth in 2007, 4.5% the previous year).